How often do we want to simply make our point, instead of bringing our opinions together to reach consensus? Wouldn’t the world be a much better place if we looked beyond our own limited perspective to understand other beliefs, thoughts, religions, passions, and goals? Leaving the issue of world peace to others, we think that this same behavior pattern is happening in design and business. Look at all the PowerPoint presentations and slick brochures: we want to tell our view, instead of listening to others. We want our opinion to be heard. It is precisely this desire to have our opinions be heard and to advance our own perspective that fuels issues of “paradigm dissonance” as attempts to resolve conflicting paradigms that demand compromise and collaboration. Identifying paradigm dissonance as a source of problems isn’t new (for example, look at the fifth highly effective habit1), but creating a framework for dealing with this problem in a business and design environment moves this idea in a new direction. Let’s begin by examining the often incorrectly used terms “mental model” and “paradigm.” According to hyperdictionary.com, a paradigm is a generally accepted perspective of a certain group, whereas a mental model (or cognitive map) is defined as an interpretive framework of the world. The mental model, it is argued, exists in the human mind and affects actions and decisions as well as knowledge structures. This means that a paradigm is an element within a mental model. In our experience the differences in paradigms among designers, managers, users, engineers, information architects, graphic designers, etc. are a major reason why business and design problems exist. Mid-size and large corporations, as part of their growth over time, divide employees into multiple departments. This employee fragmentation contributes greatly to political games and jockeying for control (e.g., “This is mine. That is yours. Don’t try to tell me what to do with mine.”), while hindering effective communication and contributing to each department feeling like its view is right and the others’ are wrong. The latter issue arises mostly because one department does not understand what the other department is doing and, more importantly, WHY they are doing it. That question of WHY goes back to the differing paradigms. A manager wants to know things (e.g., about progress, costs, revenues, turnover, etc.). His employees know things (e.g., about that individual order they scored, the problem yesterday that they solved, the payment they arranged, etc.). If the manager asks his employees about the things he wants to know, his employees mumble and tell him they will deliver the numbers next week. Those employees have to apply some (perhaps many) modifications to what they know to transform that knowledge into the things the manager wants to know. Up to this point, the problem is clear; it gets complex when assumptions are made about “what one thinks the other wants to know.” This idea about what the other wants to know is completely based on previous experiences, assumptions, and group values and beliefs. Further complicating the situation, humans tend to make what social psychologists call the Fundamental Attribution Error, which is to blame other’s perceived mistakes on some intrinsic aspect of that person (e.g., their personality or personal abilities: “they must be stupid to have made that decision”) and ignore other possible reasons. These reasons include situational variables driving behavior and also differences in paradigms; in the other paradigm the decision is perfectly logical, but you need to see it from that perspective to know it is logical. Of course, as part of this attribution error we tend to perceive our own actions as being externally driven and not internally driven. Generally speaking, there are four relevant types of paradigm dissonances: supplier-customer, manager-employee, designer-user, and department-department. Each type or paradigm dissonance involves special considerations that are beyond the scope of the present article, which focuses on ways to resolve paradigm dissonance. There are three potential approaches to dealing with this problem. On a strategic level, the insights in paradigm dissonance are crucial because those constitute the starting point for all future activities. On a tactical level, understanding is important, but there’s no need to work out all the differences: to indicate and understand them is enough. On an operational level, adjusting paradigms isn’t always possible. Therefore accepting the difference and building a pragmatic link between them seems a good thing to do. The effort in adjusting paradigms is related to the number of people involved and the importance of adjusting the paradigm. This process is focused on building a common language, which is the starting point for future exchanges. For example, bring the IT, sales and financial departments together. Have them define “customer value” (see also paradigm mapping). In the practice of information architecture, when you want to adjust the design of your website to the paradigm of the visitors, you can execute a click stream analysis or exit survey to learn more about their underlying values and beliefs. Information design practices also come in handy when we want to form a new paradigm for a specified group. These help in discussions concerning what a certain model means to people. After a long time of discussions, meetings, and presentations, the ICT (Information and Communication Technology)3 department still wasn’t able to decide on the future direction for the marketing database. The old data warehouse platform was practically falling apart, and the necessity for change was growing day by day. To solve this problem all involved groups were brought together to define what a marketing database was and what its main functions should be. This was visualized in a conceptual model that both marketing and sales people and ICT people (even the technical architects) could agree upon. This became the new paradigm in which all activities for requirement analyses and functional and technical design could take place. The project was revitalized and development took a major step forward. Facilitate interaction among different groups by putting more focus on interdisciplinary departments and interdisciplinary training. The web has been fairly effective at bringing together the graphic designers, programmers, project managers, and user experience professionals and putting them on the same team, which has resulted in a number of paradigm dissonances. Even beyond development team coordination, however, is the issue of understanding the customer’s paradigms. To better understand those paradigms, establish interaction with the customers, for example by installing customer focus groups. Those groups represent the ideal or typical customer and through their interaction with the company website and materials, various aspects of the differing paradigms involved become apparent. Distance learning courses (where instruction is entirely “at a distance” and done online) flourished for a number of years at WCC before being suddenly stopped by the administration without consulting the faculty who teach those classes. Discussions revealed not only widely differing paradigms between the groups concerning the nature, value, and appropriateness of distance learning, but also that intra-group paradigms also differed fairly significantly among the faculty concerning this teaching modality. Among the various recommended courses of action was a proposal to form a joint faculty-administration group to study these differences in paradigms and to conduct research on distance learning so that the assumptions inherent in the paradigms could be disproved, if false. 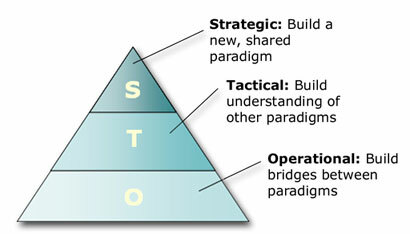 Accept differences in paradigms and implement smart ways of dealing with them (Fig 5). For example when confronting the paradigm dissonance between customers and suppliers, build a taxonomy for both and make 1-to-1 relationships (also see the Modular Network Design method, Hoogeweegen et al). For the paradigm conflict between managers and employees, one can implement a management dashboard, based on the existing paradigms in the organization. The Ministry of Health initiated a program to help disabled individuals by giving them insight into the available market of special products. The main question was: “How can the target group find products, if they do not know what they are looking for?” To solve this problem, a functional design of a web portal was created for this special group, where they could specify their disability in the International Classification of Functioning, Disability and Health (the ICF). This “taxonomy” matched their paradigm by identifying the functions that could not be executed given specific disabilities. The suppliers of special products for the disabled however, had their own paradigm: the ISO999 standard. To bridge the gap between the paradigms links were established between the two standards, with ongoing assistance from a variety of medical specialists. Disabled users can now visit the web portal and identify their type of disability (e.g., that they have problems seeing and they want to read) and learn about all the products that can assist them (e.g., glasses, magnifiers, large letter-books, etc.). Dealing with differences in paradigms is fairly new and is a field worth investigating. In our experience it is the source of many business issues, for example: unsuccessful implementations, inefficient business processes, and design problems. 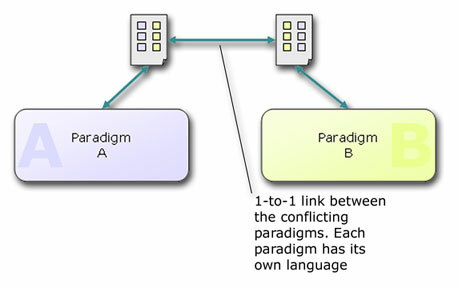 An important first step is to visualize the differences in paradigms, so that the process of connecting paradigms, establishing new paradigms, or building understanding of other paradigms can begin. Through visualization the process moves beyond just talking about the differences, which is often not enough, because all the issues and relevant elements are interrelated and, to some extent, are locked in place. Visualization offers a unique shared starting point and valuable framework for moving forward. Case studies are based on the experiences of the two authors. “ICT” is a Dutch term for “Information and Communication Technology” and is used in the same way as “Information Technology” (IT). is a faculty member in the Internet Professional department (http://inp.wccnet.edu) at Washtenaw Community College (http://www.wccnet.edu). He teaches a wide variety of web design classes, including classes on user experience, web coding, project management, and professional practices. He maintains an instructional website (http://courses.wccnet.edu/~jwithrow), although it is mainly for his students. Prior to entering the teaching field, he worked in industry as an information architect at a web design firm in Ann Arbor, Michigan. In his spare time he works as a freelance information architect and web designer. I teach Analytical Decision Making to BBA students. Your article is really good and it will help me to better illustrate the significance of paradigms and their use in business decision making.